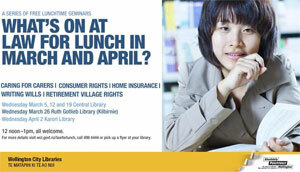 Wellington City Libraries in partnership with Community Law Wellington and Hutt Valley are continuing our popular Law for Lunch series every Wednesday this March and the first week of April. Wellingtonians are invited to come along to free weekly lunchtime talks, with guest speakers on a range of popular law topics. Wills: Will you or won’t you? Come along, listen to experts discussing the significance of the Consumer Law changes, ask for information about the new Family Carers Policy, as well as, what help and support is available to all of those who might be affected. If you’re attending, you’re welcome to bring your own ‘brown bag’ lunch to eat while you listen, and there’s no need to book a place in advance. 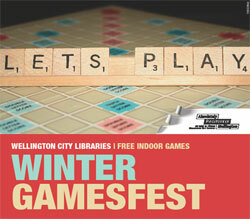 Challenges were set, high scores were beaten and the winners of the 2013 Winter Gamesfest can now be announced! The top players on our scoreboard are Tarn and Connor playing Settlers of Catan, Chris playing Scrabble, Chris, Steven, Alan and Mike playing Ticket to Ride, Simon playing Airships, Malcolm playing Trivial Pursuit, Georgia at Snakes and ladders, Chloe, June, Sarah and David at Pandemic and David and Tess at Jenga. Congratulations gamers – you played fantastically! We would also like to thank everyone who came along, participated, and got into the gaming spirit. There has been a fantastic response to the Gamesfest and we are pleased to announce that due to popular demand the gaming will continue!! A great range of epic new board games as well as your favourite classics will be available to play on Wednesday evenings at the Central Library. So come along, join in the fun and meet some fellow gamers or new faces. All welcome! FREE! No need to book, just come along – and bring your friends! Introducing our newest reading tool – Book Psychic! We have many great reading tools available to you through our website. One of the newest additions to the gadget family is Book Psychic. Book Psychic allows you to get book recommendations in the right place at the right time! Most fiction titles are included, along with some popular nonfiction, including biographies. This tool is available as a stand alone website, we’re hoping to include BookPsychic within our Easyfind catalogue very, very soon. Personalises book recommendations based on what you have read. Want to check it out? Book Psychic doesn’t require a login: point your browser here and start browsing and rating books. Need help preparing for IELTS? Know someone else who does? Wellington City Libraries now provides FREE access to Road to IELTS, an online preparation and practice website. There are over 100 hours of interactive activities, advice videos from British Council experts, hints and tips on question types as well as downloadable practice tests. It is comprehensive, up to date and aimed at the challenges you face in preparing for either the General or Academic tests. Get started over on our Languages Databases page. IELTS – the International English Language Testing System, is designed to assess the language ability of candidates who want to study or work where English is the language of communication. The General test is for candidates wishing to migrate to an English-speaking country (Australia, Canada, New Zealand, UK), and for those wishing to train or study at below degree level. The Academic test is for those candidates wishing to study at undergraduate or postgraduate levels, and for those seeking professional registration.